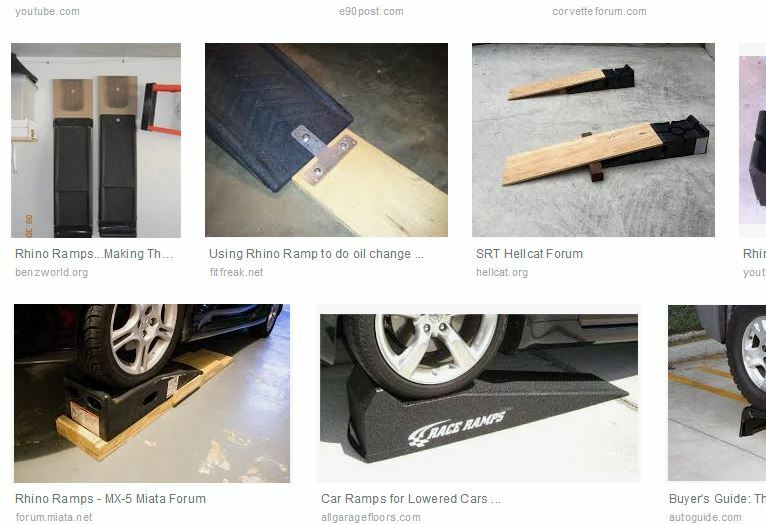 I am thinking of doing my first oil change using rhino ramps but I have a question about draining the oil. question is when I get the car on the ramps it wont be level so will I still be able to drain out all the oil, or is there a way I can jack up the front of the car while the back is still on the ramps. Racedeck flooring materials are not conducive to shop work. We have several customers that ended up pull it out after floor jacks and jack stands did permanent damage to the tiles. The flooring is fine for non working shop areas, but you can’t really do serious work with it in place. I understand but will the ramps slide around.i heard that jack stands might damage the race deck tiles.. I've been using Rhino Ramps for years, but I recently had an opportunity to use a drive-on lift for an oil change. I did not make a precise measurement, but my impression is that I needed about an additional 1/2 liter of oil to bring the reading up to full. So, I believe you don't get all the oil out using ramps. 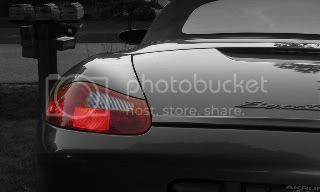 There's a spot under the front of the car (search on a term like "jacking up a Boxster") for more information. I've thought about doing this, but my mental risk versus reward calculation (i.e. the possibility of pushing the car off the ramp versus squeezing out a few more drops of oil) caused me to decide not to do it. 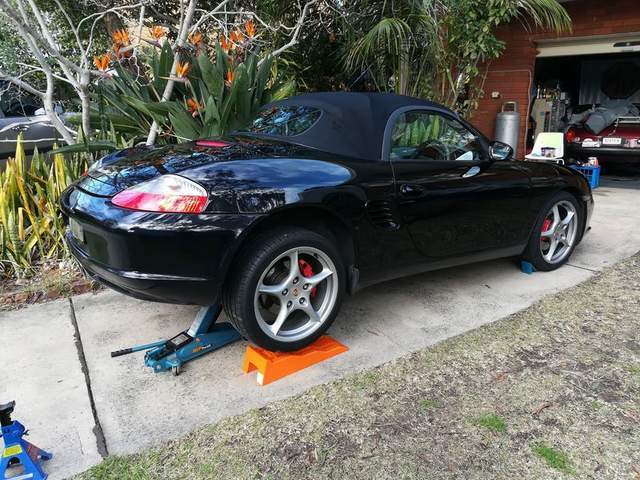 Also, the Boxster has low clearance and if the nose is pointing down, some jacks may not fit under the car. Regarding your floor - my ramps have rubber feet on them and I don't think they would slide on a Racedeck. Please be advised that the oil comes out very quickly and it may overflow some oil receptacles. You may want to take steps to protect the floor against a spill. If the wheels are on, you can only get one front wheel up at a time with a jack. I've used ramps to change my oil by backing down a slope in my driveway so the car ends up level. I've never had the ramps move when backing down onto them, but i did shoot one backwards when driving off of them one time. I've used ramps to change my oil by backing down a slope in my driveway so the car ends up level. As to the other question, my ramps have rubber feet on the bottom that keep them in place as I drive the car up them. Never an issue with me pushing them along with the car. My ramps slip on the garage floor. To keep them from slipping I lay the ramps on plywood with block of 2x4 screwed at the tall end to block the ramp. I don't see a pic exactly like mine, but just a piece of plywood or course material under the ramp should hold it. +1 . . . I have done this for every oil change since getting my Boxster. Using ramps on a sloping driveway. Same experience at my place. Last edited by Boatin; 12-24-2018 at 07:25 AM. Rhino ramps don't get my Boxster even near high enough to get under to do work. I put the rear on the Rhinos then us an air operated bottle jack to raise the car up enough to get tall jack stands under it. If you're worried about your garage floor, buy a couple of sheets of sanded shop or sanded OSB to take the jacks, stands, and Rhinos. I never have a problem getting up on the Rhinos, but sometimes they shoot out when I'm driving off them.